Fred Treviño, of United Cities Car Club, stands with his family behind his custom car beneath the Cinemark Hollywood USA marquee Thursday in McAllen. 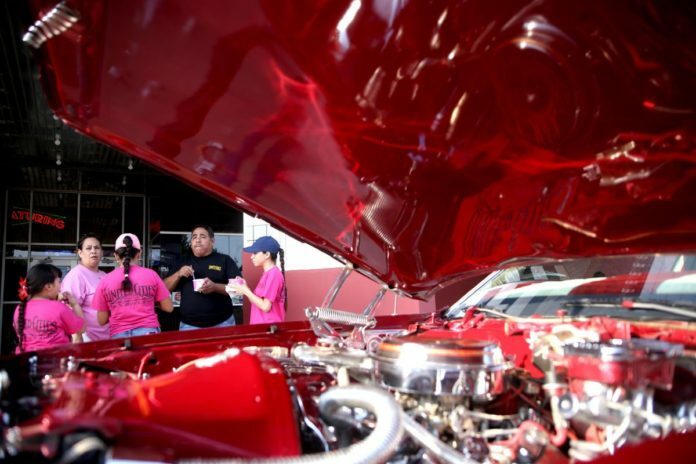 The event was to help raise awareness of lowrider culture, said organizer Rafael Soto. The RGV Lowrider Council, comprised of members from different area groups, also put on the show. Juan Garcia, of Traditionals Car Club, and Fred Treviño, of United Cities Car Club, positioned their rides on the sidewalk beneath the Hollywood marquee. Garcia’s 1960 Impala is a mostly original restoration sporting an elaborate mural of an Aztec warrior on the trunk. Trevino’s newer Caprice is all modified, with custom chrome pieces, a sunroof and a chandelier. Attendees passed by the cars stopping to take photos. The pair have known each other for decades and beam speaking about restoring, building and painting their vehicles. “That’s what makes you fall in love with your car,” Garcia said, citing long nights, work and struggle for parts. “That’s why I take pride in my car,” Treviño said. The pair were enlisted by Soto to help promote the event, and said the release of a major motion picture about lowriders could be important to get the next generation excited. While the plot of the film involves a character getting into trouble with the law, Soto says the premise revolves around if graffiti is art or vandalism. They both laughed, and stressed the family focus of their groups. Decades ago, some clubs might have had gang associations, but not now. The crews often engage in drives for toys and school supplies or fundraisers to raise money for sick friends and family members. Soto said clubs don’t have places to cruise where they aren’t kicked out by police, and local groups have reached out to establish designated parks where they can gather.